A few weeks ago, when I was dropping my daughter off at swimming lessons, I noticed her swim instructor had a rash all over his legs. He had red patches on several parts of his calves, and while it wasn’t bleeding or oozing, it was red enough that it caused me concern. I wish I could tell you I was gracious about the whole thing, but the truth is that I wasn’t. Motherhood has apparently depleted me of all of my manners, and the fear of my child spending the next week scratching her arms and legs raw was too much to bear in that moment, so before I could allow my daughter to enter the pool, I needed to know what was going on. I don’t remember exactly how I asked the poor boy about his legs, but when he told me he suffers from eczema and that the chlorine in the pool makes it worse, I wanted nothing more than for the floor to open up and swallow me. You see, I once suffered through a similar experience, only it wasn’t a paranoid mother who interrogated me about the red, angry rash on my legs. Nope. It was my fifth grade swim instructor. I can still hear his voice yelling, ‘you’re not bringing that into my pool!’ at the top of his lungs in front of my classmates, and it still makes my cheeks burn with embarrassment. Fortunately for me, I’ve mostly outgrown my eczema. I still suffer from dry, itchy, cracked skin on my hands in the winter months, but after a lot of research and trial and error, I’ve found effective natural eczema treatment remedies that not only treat my eczema when it flares, but that (mostly) prevent it from occurring in the first place. 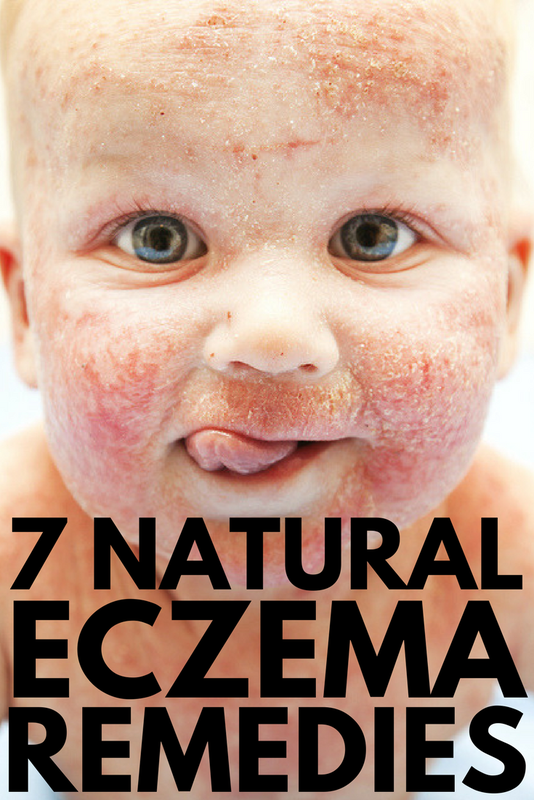 So, in an effort to make it up to that poor boy I humiliated at the pool a few weeks ago, today I’m teaming up with The Eczema Company to share 7 natural eczema treatment remedies that actually work! Eczema and food allergies tend to go hand in hand, with gluten, cow’s milk, eggs, soy, nuts, and fish being the most likely foods to trigger a reaction in those who suffer from eczema. Food allergy tests can help determine if you suffer from a specific food allergy, and an elimination diet is also a great way to gauge how your body reacts to certain foods. By removing potential triggers from your diet for a period of time, and then reintroducing one at a time to evaluate how your body reacts, you can get a better handle on what you can and cannot tolerate. Some people have gone as far as adopting fad diets like the Mediterranean Diet to keep their eczema under control, and while there may be some merit to this approach, removing your individual food triggers and focusing on a healthy diet comprised of fresh fruits and vegetables, healthy fats, and lean protein is often enough. While the research on using probiotics for eczema is mixed, those who argue in favor of using probiotics to bring the ratio of our good versus bad gut bacteria into balance raise some very important points. From boosting our immune systems and decreasing inflammation to improving our digestion and increasing our energy levels, the benefits of probiotics cannot be ignored. And if you are following an eczema-based diet that doesn’t allow you to consume foods that are naturally high in probiotics, such as yogurt, raw cheese, and miso, investing in a good probiotic is worth a try. Another natural eczema treatment to consider if you suffer from atopic dermatitis is the use of vitamins and supplements. Vitamin B promotes healthy skin, vitamin D helps heal damaged tissue, and vitamin E is known to reduce dryness and itchiness, and others swear by fish oil in the treatment and prevention of eczema. I recommend consulting with a naturopath to ensure you are selecting the right vitamins and supplements for your particular eczema needs, and that your are taking the correct dose. While there are many prescription creams available to treat eczema, more and more natural eczema cream remedies are becoming available. These are aimed not only at helping to relieve the symptoms of eczema, but also at preventing flare-ups from occurring again. The Eczema Company specializes in providing symptom-specific natural eczema cream options that are suitable for children and adults. CLICK HERE to browse their full range of natural products, and check out my favorite creams for the most common eczema symptoms below. Best cream to reduce inflammation…. Manuka Honey Skin Cream: The combination of organic manuka honey and organic tree nut-free oils and beeswax make this a gentle, nourishing formula that soothes and calms irritated skin and reduces inflammation without a burning or stinging sensation. Top with a pair of Eczema Gloves (click HERE for adult gloves and HERE for child gloves) at night for added protection and to prevent nighttime scratching! Learn more about Manuka Honey Skin Cream HERE. Emily Skin Soothers for Itchy Eczema: Suitable for babies, kids, and adults, this soothing cream is a dream come true for those who suffer from angry, itchy skin. Made from all natural ingredients – olive oil, beeswax, and 3 Chinese herbs – you will be amazed at how quickly it soothes skin and removes redness. Learn more about Emily Skin Soothers for Itchy Eczema HERE. Best cream to relieve inflamed and oozing skin…. Emily Skin Soothers for Red Eczema Rashes: If you or your little one are plagued by red, oozing, inflamed, and angry-looking eczema, this product is a must-try. It heals weeping dermatitis, and can also relieve irritation in skin folds such as armpits, elbows, and behind the knees. Learn more about Emily Skin Soothers for Red Eczema Rashes HERE. Best cream to relieve dryness and itching…. EczeHerbal #2 – Itchy Skin Rash Treatment: If your eczema causes dryness, flaking, and itching, this is another of my favorite eczema remedies. It uses different herbs, which isn’t for everyone, but having grown up in South East Asia, I’m a big believer in Traditional Chinese Medicine (TCM). Learn more about EczeHerbal #2 Itchy Skin Rash Treatment HERE. Epsom salt is a naturally occurring compound of magnesium and sulfate, and has long been recommended as a natural remedy to help soothe skin conditions like eczema. Soak for 10 minutes to reap the full benefits of Epsom salts, which include decreased inflammation, swelling, and pain, increased hydration, and other antibacterial benefits. Another important factor when trying to treat eczema naturally is managing environmental triggers. Figuring out what causes your eczema may take some time, but once you pinpoint the things that trigger your eczema flares, you can try to avoid them as much as possible. Common environmental eczema irritants include soaps and detergents, pollen, dust, pet fur, mould, food allergens (gluten, cow’s milk, eggs, soy, nuts, and fish), wools, and synthetic fabrics. If your eczema occurs on a particular area of your body, applying protective cream and covering your skin with soothing clothing designed specifically to protect eczema-prone skin can make a world of difference. From gloves, hats, and socks to underwear, pajamas, and tee-shirts, The Eczema Company offers a whole range of protective clothing for children and adults alike, which you can view HERE. If you or someone you love suffers from red, raw, inflamed, and itchy skin due to eczema, I hope one (or more!) of these natural eczema treatment remedies help. Remember to be patient, to try one remedy at a time so you can properly evaluate whether it helps your symptoms or makes them worse, and to never give up. You CAN find a way to relieve your eczema naturally! If you found this collection of natural eczema treatment remedies helpful, please share this post on Pinterest! And if you’re looking for more skin-related tips and tricks, please follow our SKIN board where we share all kinds of fabulous ideas!